You don’t have to do this alone. In fact, you shouldn’t have to! Grab your friend that is into the law of attraction and interested in Magicality and ask them to be your Magicality buddy. As Magicality buddies, you can help each other practice and hone in on your skills of attracting great and positive things into your lives. You can help each other see the positive in all circumstances, because sometimes when we look at it alone it almost seems not possible to find positive in something we may consider ‘negative’. You will help each other move past your past and be more present in the now, which isn’t an easy task. You will be there to support each other and remind one another to turn your magnets up when they are teetering or turned down. Without a buddy, you can definitely practice Magicality, but with a buddy, the process becomes so much easier. 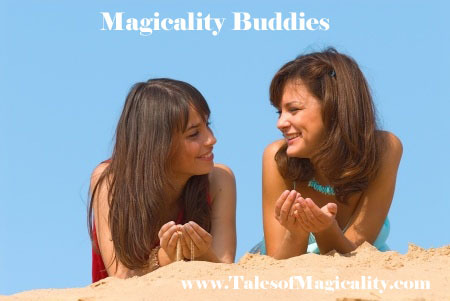 If you don’t have a buddy, go to the tab “Magicality Buddies” and connect with someone by adding comments.